Depending on where you live, you might have seen them everywhere. On the bus; on the subway; in the parking lot of Walmart. You might have been handed one instead of candy at Halloween. If you had the audacity to wait tables on a Sunday morning, you might have had one left for you as a tip. They're those little rectangular pamphlets that contain what seem at first to be innocuous comic strips, with a smiling jack o' lantern or a child dressed as a ghost on the cover. When you open them, however, they turn out to be what Los Angeles magazine has described as “equal parts hate literature and fire-and-brimstone sermonizing.” They're Chick tracts, the work and legacy of one Jack T. Chick, who died October 23, 2016, at the age of 92. Jack Thomas Chick was born on April 13, 1924, in Boyle Heights, California. Not much else is known about Chick, as he only ever gave one interview after 1975. According to his official biography, however, he did not grow up religious. He fought in World War II in the Pacific theater, and after the war, married Lola Lynn Priddle, who helped him convert to his particular brand of Christianity. For a few years in the 1950s, Chick drew a syndicated single-panel comic strip called “Time Have Changed?”, which featured caveman characters with modern personalities before such a premise was used to greater success in B.C. and The Flintstones. After his conversion, Chick decided to use comics as a method for evangelizing, because he was too shy to give his message to people face to face. His inspiration came from the successes of the Communist Party of China in spreading propaganda via small comic tracts. He self-published his first tract, Why No Revival?, in 1960, and followed it up with A Demon's Nightmare. Before long, he had converted his kitchen table into an art studio and began creating more tracts, which were very popular with missionaries and churches. By 1970, he officially founded Chick Publications and hired other artists to help him create tracts as well as over twenty full color comic books in the 1970s and 1980s. 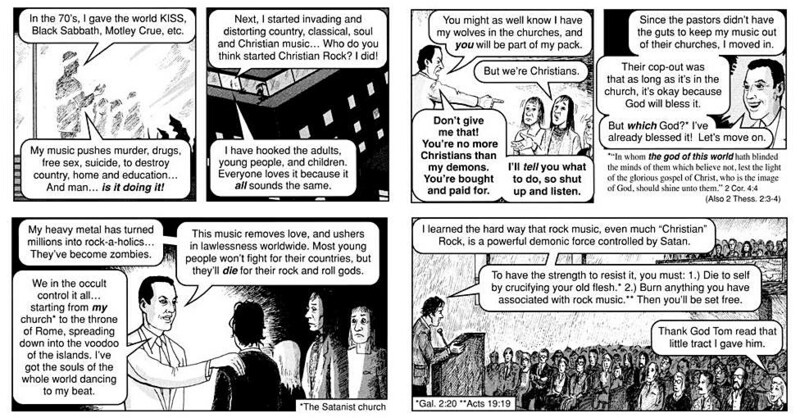 There are over 250 different Chick tract titles available in over 100 languages. The company estimates it has printed and distributed over 800 million tracts since 1960. These tracts feature any number of different themes, including how Jews are evil, how Muslims are evil, how Catholics are evil, how Southern Baptists are evil, or how Harry Potter, Dungeons and Dragons, and Halloween are tools of the devil meant to lure you into witchcraft and devil worship. Chick and his followers always practiced a very specific form of Christianity, which includes being part of the King James Only movement, meaning that any version of the Bible from after 1611 is heretical. As you know, if the King James Version was good enough for Jesus, it should be good enough for you. Catholics bore the brunt of much of Chick's... let's call it “passion.” According to his comics, Catholics are responsible for Islam, Mormons, Jehovah's Witnesses, the Holocaust, Nazis, the Ku Klux Klan, both World Wars, the Russian Revolution, the Great Depression, and the assassinations of both Abraham Lincoln and John F. Kennedy. If this is how he felt about Catholics, you can imagine his ideas about Jews and Muslims. Of all the many masterful artists that we've covered on ComicsAlliance, it seems safe to say that Jack T. Chick is the only one to regularly be described as “bizarre,” “grotesque,” “atavistic,” and “savagely anti-Catholic.” That said, the next time you find a copy of Dark Dungeons on a table at Denny's, remember that it is likely that more people have read that than Watchmen. Think about that while you eat your Lumberjack Slam.